The NUS Literary Society will be having its Annual General Meeting for the Academic Year of 2011/2012, on August 24th (Wednesday) at AS 5 Room 03-09 (Room next to LT 8), 6pm. Anyone who is an existing Litsoc member or wish to join the Society is welcome to the meeting. We will be voting and deciding on the key exco positions for the AY 2011/2012; and firming the key activities of the Society for the upcoming year. 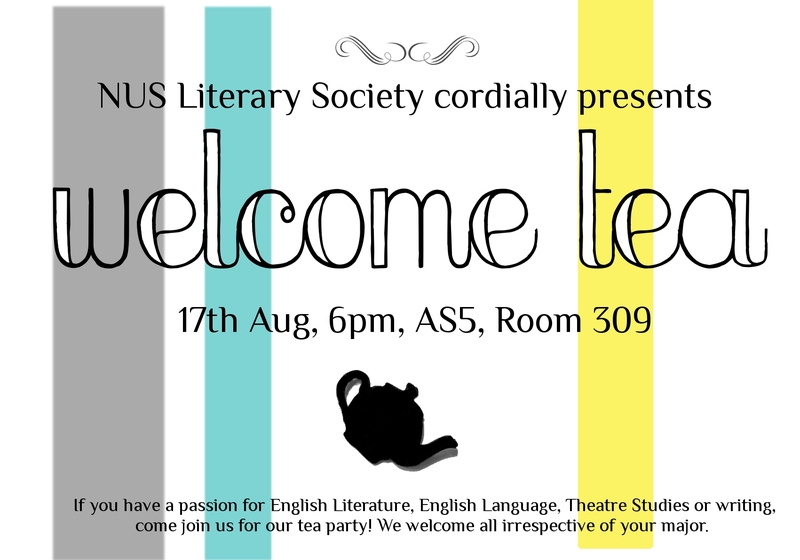 The NUS Literary Society will be holding our Welcome Tea on 17th Aug 2011 at AS5 03/09 (outside LT8, near the Litsoc noticeboard) at 6pm. Our outgoing exco will be there to explain more about LitSoc and answer any queries which you may have. There is no restriction of faculty, major or year of study to join us; everyone is welcome! Light refreshments will be available. We hope to see you then!